RSI â€“ Donâ€™t use a wrist support! I think I have an Repetitive Strain Injury (RSI) problem coming on â€“ the wrist of my â€˜mousing handâ€™ has a nagging pain most of the time, and it immediately gets worse when I start using the mouse or typing. Itâ€™s a problem, because my work basically involves typing and surfing the net (could be worse ), and I spend easily 8-12 hours a day on my computer. So, I went surfing (ahem) to find out more, and found out some surprising things from a reliable source, Cornell University: on mousing, and on typing posture. • First of all â€“ donâ€™t use a wrist support, especially the soft gel ones! • Also, move your mouse from your elbow, not by flicking your wrist. Resting the heel of your hand on the wrist support pad is not going to help this though. • Your ideal posture should not be a straight back, but actually leaning slightly backwards. 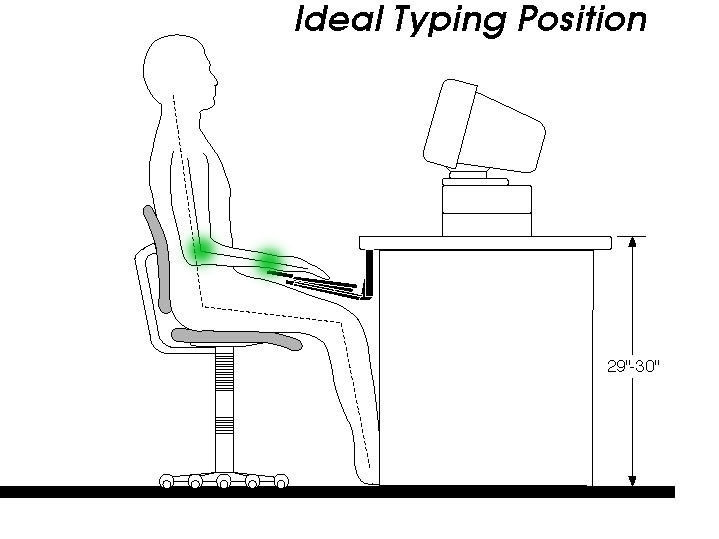 The wrist should be lower than the elbow, and the keyboard lower than the wrists. So a keyboard that slants upwards is not good â€“ notice how the keyboard in the picture slants downwards. For this a decent chair is important, the problem is they are expensive, I find that the standard cheap office chair does not have good height control â€“ but Iâ€™ve tried putting a cushion on mine to lift me up a bit higher. And a box to put my feet on, otherwise they dangle a bit (short legs!) which is not good either. • Iâ€™m also trying to use my mouse with my left hand to give the right a rest. Itâ€™s a bit fiddly, but doable. • Finally, take regular breaks. One useful way to do this is to have a software that reminds you, and forces you to stop by temporarily blocking your computer â€“ I have installed Workrave (free OpenSource) which is nice because it gives you exercises to do, and has cute sheep The problem is, it doesnâ€™t always seem to always remind me â€“ maybe because I use Vista (unfortunately). There are other similar ones out there too. There are more things, but these stood out to me. So, take care of your body â€“ do something to improve your habits today! Thanks Honestly it (the RSI) thing is worrying me... but it already feels a bit better. I'm not using the wrist pad thing, and taking my hand off the mouse whenever I'm not actually using it.